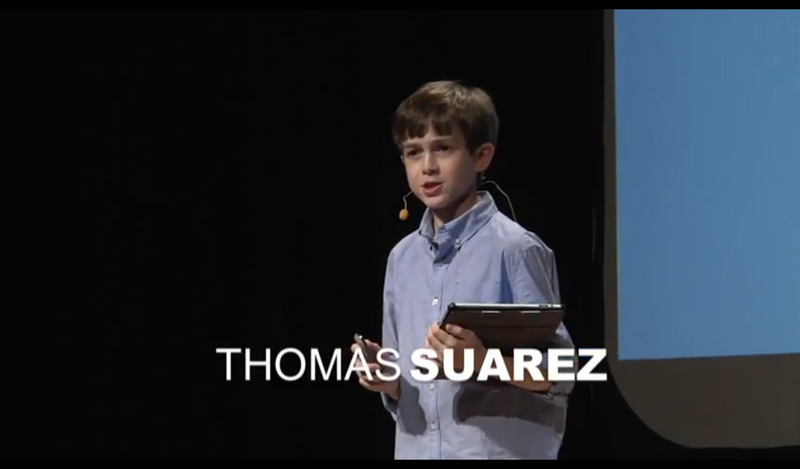 Thomas Suarez is a 6th grade student at a middle school in the South Bay of Los Angeles. When Apple released the Software Development Kit (SDK), he began to create and sell his own applications. "My parents, my friends and even the people at the Apple store all supported me," he says, "and Steve Jobs inspired me". Thomas points out that it's hard to learn how to make an app. "For soccer you could go to a soccer team ... but what if you want to make an app?" He's started a club for fellow students at school, where he shares his knowledge of programming. Thomas articulates his vision that students are a valuable new technology resource to teachers, and should be empowered to offer assistance in developing the technology curriculum and also assist in delivering the lessons. Did you read that? he likes computer before kindergarten, he develops software at twelve, do you know why STEM (science technology engineering and math) are male field? do you know why women don't feel attracted to computer science? do you know why in CES (Consumer Electronic Expo) men are the ones who attend? do you know why the E3 the biggest video games combention in the world you barely see women who are not models or reporter? By his last name I suggest Thomas is Hispanic and by living in L.A I suggest he is Mexican descendant. I'd like to see Hanna Rosin's daughter along side with Thomas in computer science. PS: I feel sorry for her son.